Quite An Event Here At House! What a surprise here at house. 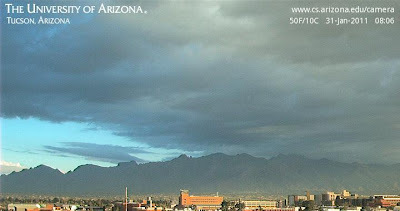 I was away to the Post Office and strong convection came winging in from the Tucson Mountains between 11:30 am and noon. Where I was, near River and 1st, there was a lot of graupel mixed in with the rain and some wind. When I arrived home, there was 0.75" in the gauge with some graupel still melting (final total 0.76"). Apparently this was pretty localized, since I noted at 12:30 pm that only 10 ALERT gauges had had any precipitation (except up in mountains where it has probably been all ice and not detected). At 7:00 pm this evening, only 24 of the 93 ALERT gauges have had precipitation (again with the ice caveat). Gauge with highest amount was Rillito at Dodge (about a mile away to the east) at 0.20". So a big event for the house and regions immediately to the northwest of here! We have solar panels being installed and the three guys working on the project were just leaving when I got home. I asked them if there had been any lightning or thunder here and they said "No" just lots of rain and ice falling along with strong west winds. I also noted on the max/min thermometer that the tempersture had fallen to 39F during the heavy rain/graupel shower. Photo above shows snow showers trailing off the west end of the Catalinas about 5:30 pm this evening (Monday January 31st). 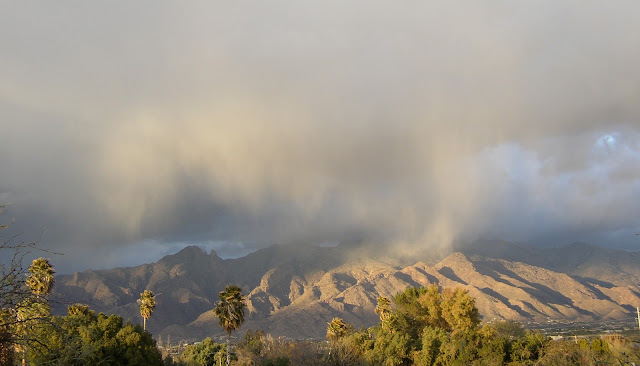 This morning at 7 am there were a few spits of rain here at the house and some snow showers up on the Catalinas - these were gone by 8 am as top image indicates. The morning low at house on the last day of the month was far and away the mildest of the month, coming in at 44F. The morning 500 mb analysis from NCAR RAP (second image) shows that the leading 500 short wave is well into Arizona and Utah this morning, with some middle-level moisture ahead of and with this feature. A very cold 500 mb cutoff is over west-central Canada. The 1200 UTC NAM forecast this morning (bottom two panels) indicates that by 5 pm this afternoon the 500 short wave will have moved to northern Mexico and stretch northward across New Mexico. The forecast also indicates a piece of the Candian low breaking off and moving south into the western US. 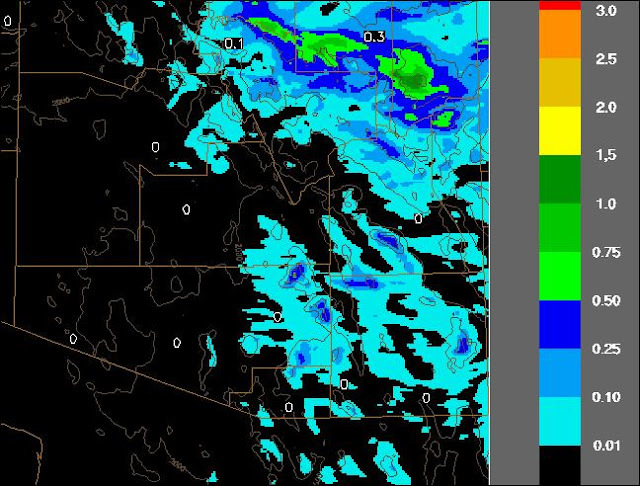 The model produces only some light showers today across southeastern Arizona, with quite light QPF amounts at 5 pm. Very cold air will hold sway during mid-week, and here at th house I expect to see perhaps the coldest morning of the winter - will have to see exactly how the cold, cut-off evolves! Rain Here before End Of Month? The 500 mb cutoff that has plowed through the Pacific ridge is now along the northern California coast. This system will open into a short-wave that will swing across Arizona tomorrow. The big question is whether there will be much in the way of measurable precipitation in southeast Arizona. The top image shows heavy cirrus moving in this morning. The middle and bottom graphics show QPF forecasts for total precipitaion ending at 5 pm tomorrow afternoon (the 31st of January 2011). The NAM forecast from the morning 12 UTC initialization indicates from 0.10 to 0.25" of precipitation across the low elevations of southeast arizona; whereas, the U of A version of the WRF model (initialized at midnight last night - bottom panel) forecasts precipitaion for the same period to be more sparse with amounts across the metro area of zero to 0.10" and amounts of significance only at the highest elevations. Quick note - the 84-hour NAM forecast ahas trended very much toward the ECMWF from yesterday - see post below - with VERY cold thicknesses here by Wednesday evening - might there be enough moisture left to squeeze out some snow showers here in town? The 120 hour forecasts from the operational versions of the GFS and ECMWF at 1200 UTC this morning (29 January 2011) are quite different over southeastern Arizona. The GFS at 500 mb (top) has a very cold 500 mb low over Oklahoma, with heights of about 567 dm over extreme southeast Arizona. Thickness values (middle - 1000 to 500 mb) are around 540 dm. However, the ECMWF (bottom) has the low over New Mexico with 500 mb heights over extreme southeast Arizona at the same time of about 546 dm (more than 200 m lower than the GFS!). The ECMWF thickness appears to be about 522 dm - a very cold value for this part of the country. Thus, while both models' forecasts indicate the change to colder temepratures, the ECMWF (if it proved accurate) would likely bring the coldest temperatures of the winter to this part of Arizona. Certainly something to keep an eye on. Also of note are the extremely cold thickness values in both model forecasts of around 480 dm over eastern Canada - Brrrrrrrrrrrrrrrr! John Roach says: A spectacular double eruption on the sun was captured today by NASA's Solar Dynamics Observatory. 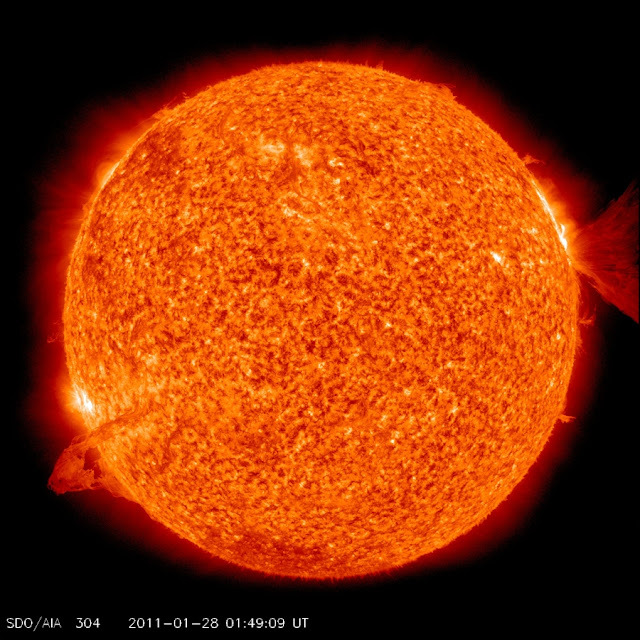 The eruptions happened nearly simultaneously on opposite sides of the solar disk, SpaceWeather.com reported. The plasma clouds produced by the event are expected to miss Earth, so there's no threat to us or to satellites orbiting the planet. On the lower left in this image of the sun, a magnetic filament erupted, and on the upper right a departing sunspot produced the strongest solar flare of the year so far, an M1-class event. The double whammy may be more than a mere coincidence: Recent research suggests that solar activity is interconnected by magnetism over large distances, and that solar storms can go global. John Roach is a contributing writer for msnbc.com. The models are indicating a slight chance for showers on Monday the 31st of January, which is the first chance of precipitation here in southeast Arizona since December 30th. The forecast panels above (all valid at 5 pm on Monday January 31st) are: NAM 500 mb from 1200 UTC this morning; GFS surface from 0000 UTC last evening; and 500 mb and surface from ECMWF last evening. The models indicate that a 500 mb cutoff/short wave will break through the Pacific coast ridge and then get nearly in phase with a short wave digging down the east side of ridge from western Canada. The ECMWF is a bit faster with this system than is this morning's NAM. The GFS and ECMWF hint at a chance of showers while the NAM indicates limited moisture coming in with the system from the Pacific. The ridge pops back up along the coast and a very cold high comes south for mid-week. But, finally something for weather watchers in the far Southwest! East winds set up during the early nighttime hours across much of southeastern Arizona, leading to low temperatures this morning that were 10 to 15F warmer than yesterday morning. Mike Leuthold noted yesterday afternoon that the WRF forecast was predicting morning temperatures considerably warmer than the NWS forecast was indicating. He sent the plot above that shows WRF surface observations for 7 am this morning (27 January 2011). It looks like the WRF was just a bit too warm but quite close, and captured the 24-hour change very nicely. Some observations this morning: here at house at 7am 45F with a nighttime low of 34F (versus 22F yesterday); TUS at 7am was also 45F with a nighttime low of 43F. Douglas changes were quite interesting: 29F at 7am today versus 16F yesterday morning at 7 am! However a few spots were about the same as yesterday, or even a bit cooler, as per the RAWS observations at: Mt. Hopkins, Rincon, Empire. This warming event indicates, again, the difficulty of low temperature forecasting across southeast Arizona, especially when there's a large-scale pressure gradient favoring easterly winds during the night. 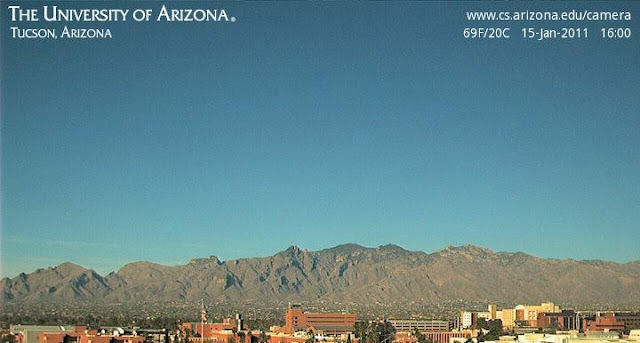 Very clear skies today as per the webcam views above - looking toward north from Kitt Peak and also from Computer Sciences, U of A. 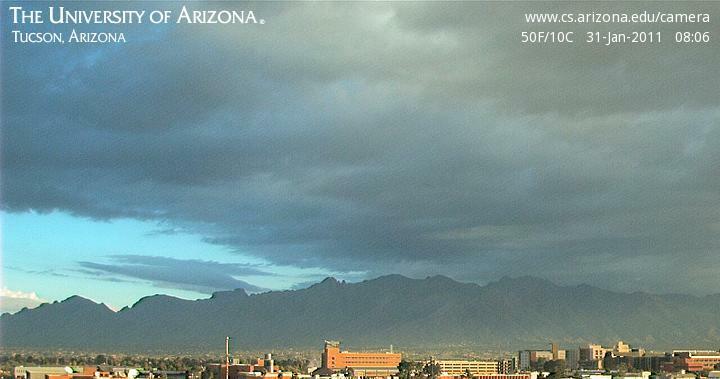 Has been essentially an entire month of "Chamber of Commerce" weather here in Tucson. The clear skies and low humidity have led to six more consecutive mornings at house with low temperatures in the 20s - starting last Friday morning the lows have been: 29F, 29F, 27F, 25F, 25F, and 22F this morning (Wednesday January 26th). Airport was 11F warmer this morning than here at house. A surface cyclone is intensifying along the Gulf Coast (see surface plot top for 13 UTC from CoD weather page), currently centered near New Orleans. I don't seem to recall many Gulf of Mexico cyclogenesis events in recent winters, but this seems to be a classic situation. The low will intensify and race up the East coast, posing a variety of forecasting challenges. Situations like this pose a severe weather threat, especially if unstable, mT air is pulled onshore ahead of the cyclone as it moves east-northeastward. Florida is clearly at threat later today, but satellite imagery at 1345 UTC (middle vis and bottom IR) indicates fairly strong thunderstorms offshore - so the first forecast issue with this cyclone is whether or not the air feeding these storms will stay mostly over Florida or be pulled further inland this afternoon. Last night's model runs indicate a significant winter storm for the Tennessee Valley, as colder air is pulled southward into the system. The models also indicate a rain/snow line that lies close to the major metropolitan areas, especially in the middle Atlantic Region. This will lead to a sloppy storm with the forecast challenge being how much rain vs how much ice and snow. So, a couple of interesting days on tap, but at other side of country. Another Big Storm For Northeast Next Week? The operational members of the ECMWF and of the GFS both forecast another deep storm next week - Wednesday into Thursday. The above forecasts are at 120 hours from 0000 UTC on 22 January 2011 for 500 mb and surface pressure and are all valid at 0000 UTC on 27 January 2011. The ECMWF (top 2 panels) deepens the storm very dramatically and keeps it very close to the coast. The GFS (bottom two panels) deepens the storm further east over the ocean, with much less impact on the cities of the Northeast. It should be noted that many of the members of the GFS ensemble forecast also keep the storm closer to the coast, making the operational version somewhat of an outlier. Regardless, it looks like more snow for portions of the Northeast next week! Looking at Mauna Kea from Mauna Loa this afternoon - Friday 21 January 2011. The blocking ridge at 500 mb over the eastern Pacific and western North America is proving to be very persistent. While this may make the MAP winter weather lovers happy back East, it is leaving the Southwest high and dry! I've posted above the GFS ensemble mean heights and anomalies for 500 mb at 60, 120, and 180 hours from 00 UTC last evening. The ridge hangs in there through the period and is actually very impressive by 180-hours, with height anamolies reaching around 300 m over west Canada! Guess the main thing I'll be recording in my journal rest of month will continue to be low temperatures. Not Below Freezing This Morning! This morning was the first in quite a while that the low temperature did not fall to 32F, or below. Low this morning was 35F. But for the previous 19 days the low was freezing or colder. During that period there 3 days with lows in the upper teens and 8 days with lows of 25F or colder here at the house. If we conisder daily lows (low temepratures at any time during the day) then the string of freezing or below was 22 days. The low temperature here at house has been below 40F every morning after the 23rd of December. Edited to add some perspective. I've only been keeping daily lows since the winter of 2005/06 here at the house. The previous longest run of freezing and below lows was in Dec/Jan of 2007/2008 and that one was 14 mornings. Precipitation - none since December 30th. Beginning to look like January could be a precipitation free month. The short-waves digging down the east side of Pacific ridge don't have a good trajectory for southeastern Arizona, and very long-range model forecasts don't show any particularly good-looking systems. Have had to water down the plants twice this month and will likely have to do so again next week. Son Jason and friend Steven Flood fly fishing on the San Juan River, below Navajo Dam, in January and having some good success yesterday. Makes me shiver just to look at them. Jason said the water was very cold, but they were out there again today. The GFS and ECMWF are still vacillating some at the 96-hour period from last evening's 0000 UTC runs. The models' 500-mb forecasts are shown above. The GFS now has the vorticity maximum in the Southwest over southwestern Colorado; whereas, the ECMWF has returned to forecasting the maximum further to the west, i.e., over far southwest corner of Utah. The GFS spaghettis chart at 96-hours indicates that greatest uncertainty stretches from the Northeast to the Southwest and into the east Pacific, off the West coast. Note that the two models have height differences of 60 m or so over northwestern Arizona and southwest Utah at 96-hours. Primary impact of the model differences will likely affect northeastern Arizona (i.e., the Flagstaff NWS Office), where there may or may not be some snowfall as the short-wave approaches and moves by. Nice example of how scientifically unrealistic it is for the NWS to be doing small-scale, gridded, deterministic forecasts out to seven days. The 168 hour forecast of the ECMWF for 1200 UTC on January 20th is shown above. The ECMWF had been forecasting a fairly substantial cutoff at 500 mb to dig into the Southwest - this continued until two forecast cycles ago (0000 UTC) when the cutoff was no longer forecast to develop. The current 120-hour ECMWF forecast valid at the same time forecasts a positively-titled shortwave to be crossing Arizona and the central US at 1200 UTC on the 20th. This is now similar to the GFS forecast valid at the same time - see below. This is the second time in the last couple of months that the GFS has been more accurate (I'm assuming) than the ECMWF at 168-hours. So, right now both models' forecasts indicate that precipitation at mid-week will remain north and east of most of Arizona. So it goes, as 2011 remains precipitation-free. 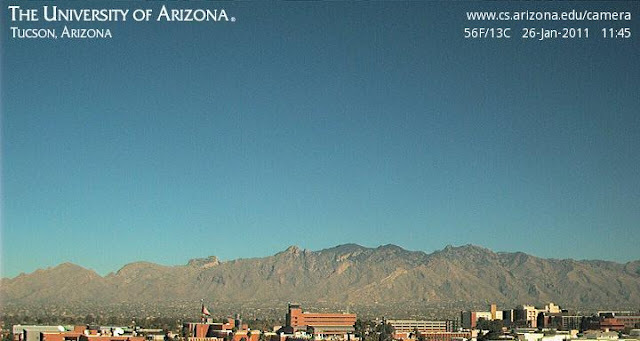 Meanwhile, it's about as nice a day here in Tucson as one could hope for in the middle of January. > > What you failed to mention: This statement was by Professor Cox at the Second Convention of Weather Bureau Officials back in 1901, according to my friend Don Baker. Correct - Don sent this along to me also. I posted it initially without the pertinent who, when, where details to see if anyone would inquire about who said this. Chuck adds: It's fascinating that things really haven't changed much in more than 100 years regarding this. Of course, fewer forecasters have any clue what to do without models, but that's another story. Back on December 28th I stated on this blog: "I can't imagine how weather forecasting would go if all the numerical modeling centers crashed for several days." "Forecasters are relinquishing their meteorological input into the operational product going to the user. Forecasters are operating more as communicators and less as meteorologists. Since this practice is increasing slowly with time, it can be called 'meteorological cancer.' By this is meant that today's forecaster can, if he chooses, and many do, come to work, accept Numerical Weather Prognoses (NWP) and MOS guidance, put this into words, and go home. Not once does he have to use his meteorological knowledge and experience. This type of practice is taking place more and more across the United States....."
One needs only to read through most (not all) NWS FDs to realize that Snellman's diagnosis of meteorological cancer was spot on and that the disease seems to be in its terminal phases. Thus, I don't really need to elaborate on the impacts and chaos that would follow a complete crash at all the numerical modeling centers. "I believe that the forecaster who has shown himself competent should be given free rein; that he should not be hampered and restricted by set rules, but that he should be encouraged at all times to make his forecasts in the interests of the public...the more stringent the rules under which a forecaster works, the poorer his predictions are likely to be." The ECMWF has interesting forecasts at 144 and 168 hours from 12 UTC this morning. The top panel shows the ECMWF surface forecast valid at 1200 UTC on Wednesday the 19th of January 2011. Looks like a play-it-again forecast for the Northeast. The 500 mb ECMWF forecast at 500 mb for 168 hours is shown in the middle panel, which is valid at 1200 UTC next Thursday morning. This model forecasts a cutoff along the southern California coast - this would be the first interesting chance for weather in the far Southwest during 2011 However, the GFS at 168 hours (bottom panel) is quite different, with a weak, low-latitude wave and northwesterly flow over most of the West. So, it will be interesting to watch the two models as their forecasts evolve over the weekend. 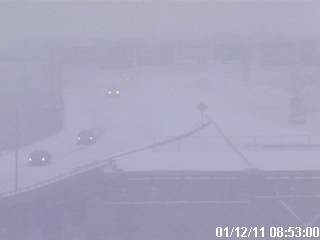 Another storm is dumping snow in the Northeast this morning. The 13 UTC surface plot (top) shows that the low was centered near Cape Cod this morning. 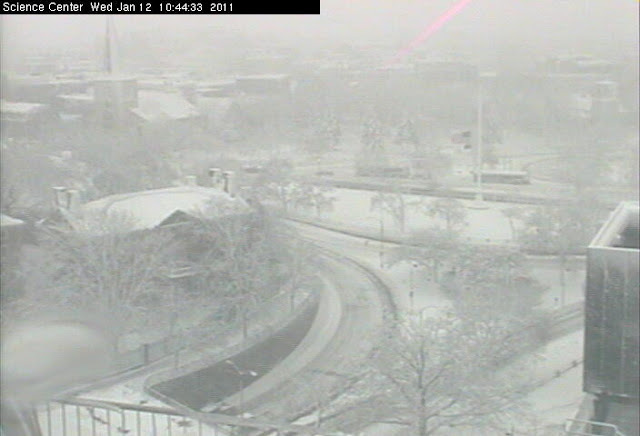 The middle photo is a webcam shot of the Albany-Rensselaer Station in New York this morning and the bottom photo shows the Harvard Science Center near Boston. I saw a news headline this morning stating that there is snow cover today across all of the continental states except for Florida. Both the East and West coasts are having quite a winter. 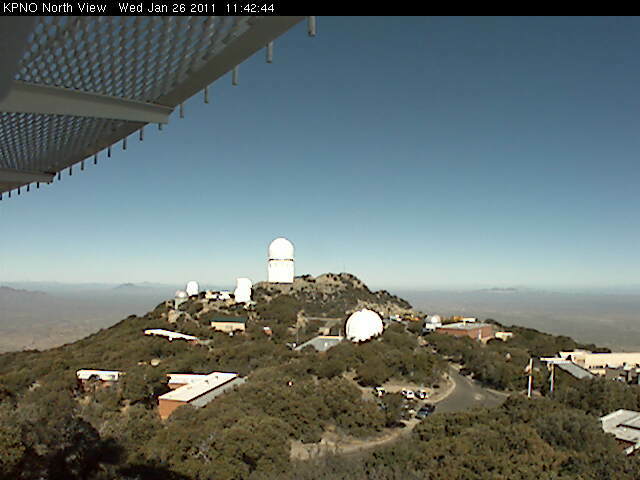 Here in southeast Arizona there has not been much weather of note yet during 2011. It has been quite cold here at the house in the mornings. The stretch of consecutive days with lows of 32F or colder has reached 13 mornings now. Coldest of these was 17F and mildest was 30F. The low this morning was 29F, even though there was quite a bit of cloud cover during the night. Brrrrr. What Exactly Does This Forecast Mean? POSSIBLE FREEZING RAIN AND A CHANCE OF SNOW OR SLEET AFTER MIDNIGHT. Someone sent the above zone forcast to me. It was for his location's Zone Forecast during one of the recent Northeast storms. He asked: What exactly does this forecast mean for me? My answer was that it says there's a chance of rain, or snow, or drizzle, or freezing drizzle, or sleet during the rest of the night, and that with all this plethora of possible precipitation types there's an 80% chance that 0.01" of precipitation will occur. I may be wrong, but I think that the grid pont forecasts may drive the Zone Forecast wording, leading to this somewhat confusing forecast. The above is from the NWS FD this afternoon (5 January 2011), indicating 7 straight mornings at TUS with lows of 32F or colder. This is interesting since I checked my logs and show 6 straight mornings with lows below freezing. The difference is due to the fact that I read the morning minimum a bit after sunrise each day and have no continuous trace of the temperature with time. On the morning of 30 December the low here was in the 40s. The temperature then fell some during the morning rains into the upper 30s - thus, morning low on 30 December was not below freezing. Looking at the TUS records I see that the low temperature on December 30th occurred just before midnight that night (i.e., not a morning low but a low for the day), accounting for the difference in our statistics. For the last 6 mornings the average low at TUS has been 27F and the average low here at the house has been 20F. Needless to say, it has been quite frosty here along the Rillito. The strong blocking at high latitudes of the Northern Hemisphere continues into January. The GFS ensemble, mean forecasts for 500 mb, with height anamolies overlain, are shown above for 72 and 168 hours from 00 UTC last evening. The high heights at 72 hours reach from Greenland across north polar regions into Siberia. By 168 hours the model forecasts the North American high to shift a bit westward, while blocking weakens over Siberia and strengthens over the Northwest Pacific and Bering Sea. During December 2010 somewhat similar blocking was associated with unusually warm temperatures, at high latitudes, from eastern Canada to the Bering Sea and unusual cold from Siberia to Europe. Water vapor and PW image﻿s for the eastern Pacific this morning indicate that the strong moisture plume from west of 170 E is being pulled northeastward all the way into western Canada. The cutoff low west of California is beginning to tap some of the higher moisture from its west and northwest. An interesting situation to follow, since the models do not eject this system to the east until Thursday and Friday. There is a video where we toss boiling water in the air at -28F!!! Note - I attached David's video here - he has a very nice discussion of what's happening on his blog, along with the video. 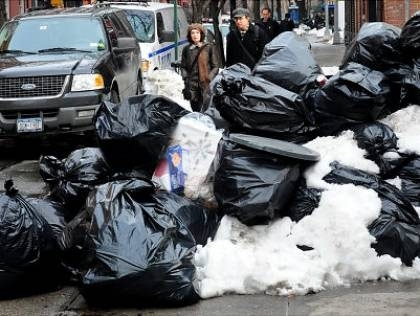 Top - After the blizzard and snow dump in NYC garbage piles up in streets. Sanitation workers drafted into emergency snow plowing efforts, leave the city in different kind of crisis. The news this morning indicates that limitated garbage clearing will begin today. Middle - Three mornings of low temperatures in the teens here at house took their toll, bringing down many cactus limbs or arms in the yard. 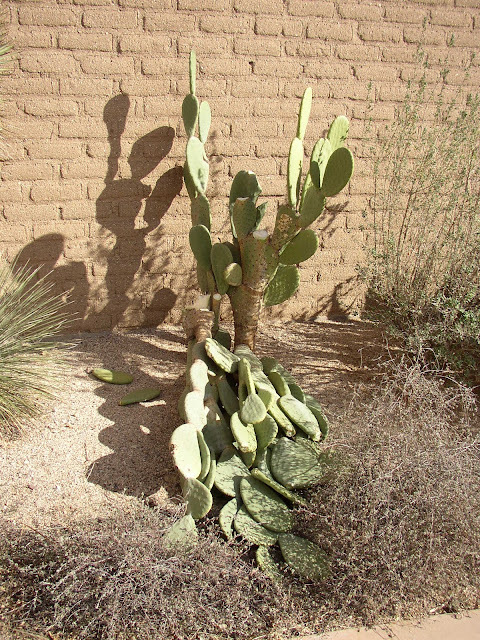 The photo shows that even cactus close to warm adobe walls froze. The variety of prickly pear in the photo (unknown to me) is probably native to Mexico, and is particularly vulnerable to extended cold because of its large and heavy limbs. Bottom - strong moisture plumes continue being pulled to the north across the central and east-central Pacific. Important question for later in the week will be: How far north will the cutoff 500 mb low west of northern California be able to pull subtropical moisture? Finally, I note that the ECMWF forecasts two strong coastal storms in the northeast during the next 10 days. The GFS appears weaker and more to the east - a bit of deja vu to start the new year.